Arrange the class in a scattered formation with each student equipped with a b-ball . Make a boundry that is large at the start(b-ball out of bounds) . The object is to dribble with one hand and steal the ball with the other. A penalty(5 dribbles) occurs if they go over the boundry , lose control or it is stolen . The next time make the area smaller(half court) , then smaller (foul line) . Assemble the class on all the lines on the gym floor , including the 3 point arc and volleyball lines . Chose 2-3 PAC-MEN with a different colored b-ball while all others have a b-ball . All students must stay on the lines and if tagged trade b-balls with the PAC MEN. During the activity have them change directions at the teachers calling. If a student loses the dribble , they must walk off the line and wait until they are set free from another player. Add more PAC-MEN from time to time. Place 12-15 traffic cones around the area while all students have a b-ball . Knock down about half the cones and leave the others up. Chos ewhich team has to knock over the cones while the others pick up while dribbling the b-ball . Most cones up or down wins . Place the students at 4-6 baskets with two b-ball at each place . The first two students in line must dribble (3) times and then touch b-balls . The first basket in wins and then challengs the next person in order. If any student wins (3) in a row , they challenge the next students at another basket . The object is to challenge as many new students and win (3) in arow at each place. Place the students on the two arc circles /3 point lines on frisbees or poly spots. In between the teams place a traffic cone to differentiate the teams. There should be about 5-6 poly spots on each side of the cone . There will be two games played at once , thta is , one on each end of the court . To make it easier to check for teammates have two differnt colors of frisbees or spots . Start the game with a two on two set up. Give the ball to any poly spot person who will pass the ball to a teammate . Any shot that is missed and is rebounded must be passed to the closest poly spot player. There will be no stealing a dribbled ball and only three dribbles are permitted . A passed ball may be stolen , then passed to a teammate on the spots. A score goes to the opposite team to start the next play. After a few moments , the players move to the far spots and the two players closest to the cone continue play. The outside players must stay behind the arc . Divide the class into 2 or four teams depending on the class number of students . Start a ball at one end of the a line of students . The first person must hand-off the ball and the passing continues until the person on the other end receives the ball . That person goes to a designated basket and shoots the ball into the hoop before the other person can do so. Exchange new shooters each time. For younger students change the size of the ball and place a hula hoop over the basket to shoot into instead of the regular basket. They may chose either appliance according to their ability . Divide the class into two teams with one team near the b-ball hoops. If there are six baskets then that will have more chances to score and shoot . The other team stands on a line and must run around the three designated bases in order (first , third and home). When the entire team runs around the bases a stop signal signifies the shooting team to count there number of total baskets. Switch positions and compare the number of baskets made. Repeat the process but for the second time have the runners dribble a b-ball instead. Line up each of two teams on the sidlelines of the b-ball court . Chose the first four players from each team to face each other at the midcourt line. Throw two basketballs toward their designated baskets . After receiving the rolled ball , they take designated spots on the four corners of the foul line -one each on the end of the foul line and the other two at the foul blocks . The person who gets the ball passes to a teammate and the process continues until there are four passes with the last pass the shooter. If that person misses then another person shoots from there position until a shoot is made. At this point those four go to the end of the sidleline and the next four players play. Place one group each at the four corners of the b-ball court with all players in each corner in a single file(one behind the other) . The two groups on teams are diagonal and facing each other. Give the two corners a b-ball in which they will try to knock over a bowling pin that is placed in the middle of the floor on the center jump circle. Assign baskets for shooting for each team. If the pin is knocked over those two teamd will go to their baskets and shoot until the other team knocks over the pin . ( it is replaced ). At that point the shooting stops and the baskets are counted. Repeat the process . Place a coin(quarter) between two teams facing each other. There will be 4-6 teams . They must bounce pass the b-ball and move the coin from a marked square with tape. The objesct is to knock the coin out of the square or farthest from the center of the square. Mark off two lines with tape about 6-8 feet from the taped square . Assign the students to six baskets(or 4) with a basketball for each group at the foul line area. Place a cone or poly spot along side the free throw line . The object is to make one free throw at each basket. At this point the whole team moves to the next basket in a clockwise order. The person who makes the free throw is the rebounder for the next basket. The reason for the poly spots/cones is that there may be a clogging up with a new group moving around in order. In this case , there may be three groups at a foul line but not likely. If that happens then have one group skip to the next basket and go back later . AS an alternative have them make a foul shot plus a lay up before they proceed to the next basket OR establish a shot clock and time them how long it takes to complete the circuit and repeat for a better score . Arrange the class into two parallel lines about( 20-30)feet apart on designated lines(midcourt and endline). At one end of each line place a hula hoop or box with 4 basketballs. The first person picks up one ball at a time until all 4 balls are passed to the end person. That person will shoot the last ball into a designated basket . First basket scores one point . Change new end people until all have had a turn to shoot . All of the b-balls must be handed to each person in order and placed in the hula hoop before a shot can be taken . DEFENSE : At each of six baskets place four poly spots or markers at the foul line corners and under the hoop and equidistant apart. On each spot , place a student and one basketball per hoop. Chose one player to go to the center area while the othe rthree players try to pass the ball(bounce pass , chect pass , overhead pass). The center player must try to steal the ball or in touch it and the person who made the error replaces the center player. make sure to let all players try to play the DEFENSIVE position. FOUR CORNERS : Arrange the class in the same positions as the defense game except there will be no position in the center. Start the ball at the marker closest to the hoop on the right side . That student takes a shot(lay-up or short shot) . If the shot is made then that person moves to any of the other three positions and all players switch. If there is a miss any closest rebounder will shot from their spot and continue the switch process . The object is for all players to make a shot from all four positions. The first student to complete the courese will be the rebounder. All players will shoot together at their respective baskets. As an alternative have the students pass the ball for a few moments and when "shoot" is called that person takes a shot . A miss will determine another shooter with no switches. The first team that scores wins the point. Arrange the class at each basket from 4-6 players . Chose one player from each team to start the game. The other players will be standing on poly spots and facing each other around the foul line area. The object is to score a basket before your opponent . Any ball that is rebounded must be thrown to a sideline (poly spot) player. There will be in place dribbling only and a ball may be stolen from a sideline pass. After a score the ball goes to the other team to start over. After a few moments have the players move up one place with the two starting players under the basket. As an alternative change players often for more variety to cahllenge other teams. Why do well trained athletes so often miss such easy baskets? Making free throws is the most critical difference in a game so what is the answer? One part is skill ,one part is practice and one part is psychology.It's a mental thing on the floor in the rhythm of the game and at the fouline ,the flow of the game stops and its not in rhythm with the game- an interruption occurs. 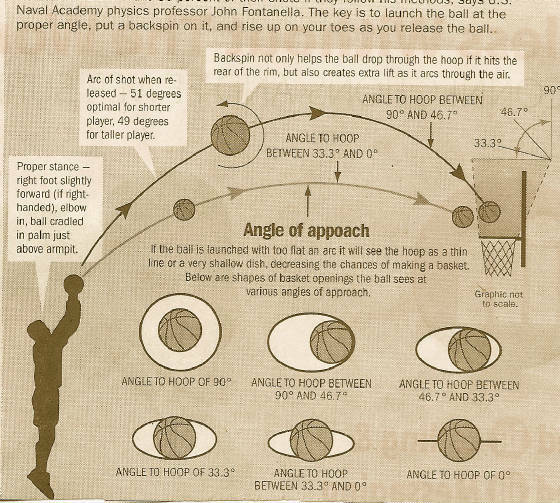 According to statistical norms and physics,it seems for shorter players is to shoot at a 51 degree angle abd for taller players its at 49 degre angle.This ensures the ball will arrive at the slowest possible speed(11mph) enhances chances of going through the hoop or hits the backboard.It helps to "see" as much as of the hoop as possible ,i.e.,if the 9" diameter of the ball had eyes it would se the 18 " diameter hoop as perfectly round coming straight down at a 90 degree angle.IF launched on a flat arc ,the player will see the hoop as a thin line or shallow dish.With proper form ,it will spin backward causing maximum force giving the ball extra lift as it arcs. Stand at the same spot behind the foul line each time with the foot on the shooting hand slightly advanced ,which fres up the shoulder action on that side. Next,the ball is lifted just above the arm pit creating a "V" between the thumb and forefinger. The player should look at the metal plate that attaches the rim to the backboard. Lift with the legs and raise the shooting arm as though reaching out the top of a phone booth and wave goodbye with aflick of the wrist. Don't stand too erect and the shot comes from the legs .To overcome that practice from the 3 pt.line then they won't fall back on heels.Usually foul shots account for 20% of the points. Th epoint being it takes more practice but with most skilled players,they work on dunks and 3 pt. shots. SHOOT AROUND Equipment: 3-4 small hoops or poly spots or other floor marker that would not be in the way. 1 basketball per group There can be anywhere from 4-7 players per group. Place 3 small hoops or poly spots on the floor around the basketball hoop. I use inside the foul line and on each side of the basket just outside the key. One player stands in each hoop and must keep one foot in the hoop at all times. The other foot can move as necessary (pivot) and the player can switch pivot foot as long as there is one foot in the hoop. Players in the hoops are the offensive team. The hoop cannot be dragged anywhere else on the floor. The defenders do not get a hoop and can move anywhere in the designated court area. There must be one less defender than there are people in the hoops. Example: three people in the hoops, only two defenders. Four hoops -3 defenders. I have tried only one defender in a group of three hoops or 2 defenders in a group of four hoops and it works depending on the numbers, skills and attitudes of the players. To play: Defenders start with the ball and inbounds the ball to one of the offensive players. Once the hoop person has the ball the defender can defend by getting to within an arms length of the hoop person and trying to intercept or block a pass. Defenders are not allowed to try to steal the ball out of the hands of an offensive player. The offense passes the ball until each of the people in the hoops have touched the ball at least once. Once the ball has been touched by all the hoop people one of them can shoot the ball. If it goes in, the people in the hoops all score two points. If does not make it, the hoop people can try to rebound as long as they keep a foot in the hoop. If successful in rebounding the ball again has to be passed to all the hoop people before it can be shot again. If the defense rebounds the person who last touched the ball before the defense control it loses the hoop and the defender who has been in the longest becomes the new hoop person. If the defender steals the ball, the same switching of defense to offense happens; the person who has been defender longest will become the next hoop player. When offense/defense are switching the player has to take the open hoop rather than a hoop of choice. At the beginning of the game the defenders have been in the same amount of time, I will just have them decide which one gets the hoop first and proceed from there. If the offensive person is slow to pass the defenders can count out loud "one alligator, two alligator.... to 5 alligator. If they can finish 5 alligator then the hoop player commits a turnover and gives up the hoop. Defenders must count out loud and not skip any numbers. One defender must always go to whoever has the ball. They cannot leave the ball unguarded. There is no penalty but I have to remind the defenders to guard the ball. Variations: Sometimes designate with a pinnie or sash an offensive player who can move out of the hoop once the ball has been put into play. It is always interesting to watch how the students handle this change. Place the hoops in different locations from game to game. I briefly talk about fouls. It seems like the less I mention it the less fouling seems to be a problem. If there is a foul of some sort. I have the play start over with no change in positions or once in awhile I will let the fouled player get one unguarded shot (worth 2 points if successful). Divide the class up into fairly equal numerical groups according to the amount of basketball rims available. However, have at least eight students in each group. Give each group three to five basketballs. A good ratio is one ball for every two students. Choose one person in each group to act as the counter and one other person to act as the defender. Each round should last one to three minutes. Change counter and defender after each round. The group attempts to score as many baskets as possible; the counter stands under and behind the basket and counts each successful basket; and the defender attempts to block shots, get rebounds and safely roll or bounce pass the ball away from the shooting area. Once a ball is cleared from a shooting area, it may be picked up by another group and used to score baskets. Players may wander into another territory to retrieve a ball, but this will cause their group to be a player short during that time and thus probably reduce the total score. At the end of each round, the counter announces the total baskets. Challenge the students to beat this total for the next round. Variations: 1. Do not allow students to cross designated lines. Therefore, they may only work with the balls that are rolled into their area. 2. Choose two or more students to act as defenders. 3. Allow only certain types of shots - foul shots, lay ups, etc. 4. Play competitively - One or two students from each team become the defender in another area. When they get a rebound, they attempt to bounce pass or roll the ball out of this area into their area so that their team will have more balls to shoot. The team with the most baskets is the winner of that round.
. Scatter polydots inside the 3 point arc; put square ones on the free throw line and stars on the arc. The students are in short [2-4 people] relay lines. The idea is to dribble down to one of the markers, and shoot. If you make it, take the marker [don't forget to dribble or I will take the marker away from you]. We have 3 baskets, one on each side, and the main one. You can shoot at any basket from a dot, only the corresponding basket for the free throw, and the stars can only be shot at the center basket. When most of the markers have been taken, remind the students to keep their dribble "alive" while waiting for a turn to shoot. At the end, they tally their collective points. Lightly pack a bunch of basketball-size snowballs and then use them to build a course of hurdles to jump over in a round of follow the leader. Team up for a slip-sliding variation of tug-of-war. Tamp down a wide, shallow trench in the snow to serve as the midline. Then, take up positions at the ends of a long, thick rope and let the tugging and towing begin. Whichever team pulls the entire opposing group over to its side of the trench wins. Tie a white cloth to the end of a short stick or around the bowl of a wooden spoon. Then, give each child a chance to hide it by staking it anywhere within a predetermined set of boundaries. Keep track of how long it takes for the rest of the group to find it. Whoever hid the flag that takes the longest time to spot wins the game. For this pitching contest, first mound up snow to create three bases and a pitcher's mound. They should each be about 2 feet high and 20 feet apart. Next, build a tin can pyramid on each base. The challenge is to knock down the stacks in order from first to third base by throwing snowballs from the pitcher's mound. The child who succeeds with the fewest pitches wins. Once you've built a plump, frosty snowman to stand sentry in your front yard, make a game of topping him off in style. Take turns trying to land a hat on his head by throwing it Frisbee style from 10 or so feet away. Pair up for a contest in which the object is to finish with the biggest snowball. The contest ends when the teams can no longer roll their entries or when you run out of snow. All you need are two teams of three or more people to play, along with a spray bottle filled with a mix of water and food coloring to mark the playing field (a large rectangle with a centerline should suffice). The teams line up at opposite ends of the field (the North and South poles) for a kickoff. Once someone on the receiving team catches the ball, he tries to move it back across the defense's goal line by running with it or passing it to a teammate. Play stops if the person with the ball is tagged by an opponent or slides out of bounds. The teams then face off again on the spot. After four tries, or a touchdown, the ball goes to the other team. The game ends when either team gets cold. The highlight of the day for the younger set in our family is when the ice train pulls into the party. To form this line that snakes around the ice, all you have to do is grab the hips of the person in front of you and hold on tight. Of course, the front person is the locomotive, so it's a good idea to put one of the stronger-skating adults at the front of the line. Ice is an ideal surface for all kinds of sliding and pulling races. And these games are a great way to build strong skating muscles. We like to bring our runner sleds out to the rink for this event, which is played in teams of two. One person sits on the sled while his partner pulls it along the ice. The object is to race around the rink faster than the opposing team (or teams--three sleds make for an even more exciting event). While we love to skate, we're not such fanatics that we ignore one of the ice's most fun forms--that of a gigantic bowling lane. On the night before the party, we fill ten (or more) plastic quart or liter bottles and several gallon jugs with water. We add a bit of food coloring to each, then put them out to freeze. To play, we set out the quart containers as bowling pins, back up ten feet or so, and use the frozen gallon jugs to knock down the quart jugs. Sometimes, the best games to play on the ice are the ones we're used to playing on dry land. As you would for a steeplechase, set up an obstacle course following paths through boots, hockey sticks, benches and any other items on hand. Try balancing sticks on top of boots for skaters to step or jump over. Or two people can hold a stick at hip level that skaters pass under. To finish, all skaters must pass through a human tunnel, made by the nonparticipants. We play this game by shoveling a wagon-wheel shape in the snow, complete with hub and spokes. One player, designated the fox, chases the other players (the geese) around the wheel using the spokes to cut across the circle. When the fox tags a goose, that person becomes a fox and joins in the chase. The game is played until all the geese are caught. The last one becomes the fox in the next game. One of our favorite ways to introduce young skaters to the thrill of hockey is through broomball--a version of ice hockey that you play using brooms and a rubber ball instead of sticks and a puck. This game is best played with a ball that's about the size of a bowling ball and very light and bouncy. With a good wallop, you can send the ball ricocheting off knees and arms--and you don't have to worry about anyone getting hurt. Set this game up like a hockey game, complete with snow-boot goals (about six feet apart) and an equal number of players on each team (six per team works well). Start the game with a face-off at center ice.